What is it with little kids and pressing buttons? See a button, they have to press it. 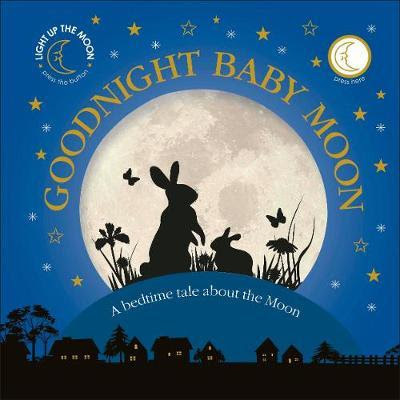 If this reminds you of a special little someone, you might like to check out Goodnight Baby Moon. A lovely thick board book with a hard cover, Goodnight Baby Moon is a simple bedtime story about the different phases of the moon. And, irresistible to little hands, a special button on the front cover lights up a gorgeous shadowy moon (seriously, the kids will never stop pressing this button). Goodnight Baby Moon will take you and your little listener on a journey through the forest. As a group of little rabbits gaze at a full moon, half moon, no moon and crescent moon, they learn how the moon changes shape and that even when it disappears, it always comes back. Simple and pretty illustrations with lots of shadowy blues and greens and black silhouettes are just perfect for young eyes, and the story is short and sweet if you're trying to engage little wrigglers. A calming bedtime story for little ones (with the added bonus of a button to press), Goodnight Baby Moon is a lovely book for babies and toddlers.